California Dodge Challenger owner lowers his MOPAR the right way. Here’s how he did it. Gregg M. here in Los Angeles bought his 2017 Dodge R/T Challenger new off the lot. After several months of keeping the car stock, Gregg decided it was time to set the stance up right and eliminate some of the body roll and nose diving he was experiencing under hard cornering and heavy braking in the canyons here in LA. From the factory, 95% of Challengers from 2008-2018 have quite a bit of gap between the tire and the wheel wells. If you have a truck, some gap is okay. For a Challenger however, closing some of that space is key to not only look amazing, but to lower the car’s center of gravity and ride awesome as well. 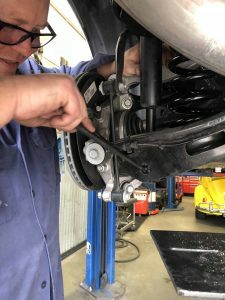 For Gregg and for all 08’-18’ Challenger owners we recommend running a high quality set of lowering springs to eliminate wheel gap, improve handling and total vehicle responsiveness. 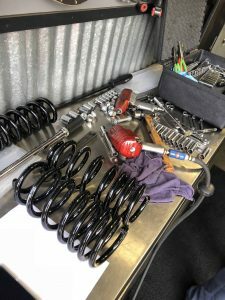 We took our three decades of shock and spring knowledge and developed a set of lowering coil spring designed for performance. Lowering 1.25 in. out front and 1.3 in. in the rear – Our new AXS line of lowering springs offers a lowered stance without sacrificing performance or ground clearance. We installed our AXS lowering spring kit on Gregg’s car and end result turned out perfect. 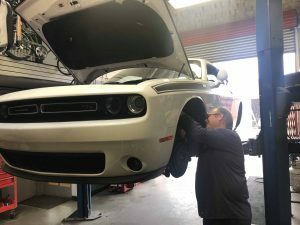 For additional details on lowering or how to lower your Dodge Challenger, feel free to give us a call.